The aim of this most interesting exhibition, organized by the Museum of Byzantine Culture, is to highlight on the most famous edifice of Thessaloniki, as a symbol and trademark of the city: The White Tower. The exhibition entitled White Tower: Thessaloniki's symbol through time, is due to last from September 5, 2003, up until the year 2006, when the monument will be turned into a museum. The photographic material of the exhibition intends to take visitors to a journey through the history of Thessaloniki's monument that -although it is relatively new campared to the centurie-long history of the city- became its symbol. The depictions of engravings, post-cards and photographs that run through a period from the 17th century to our times and have as a main theme the White Tower itself, record the monument's history and the shape of the city during its last three centuries. All the photographic material of the exhibition is published and comes from the archives of Museums and famous private collections. 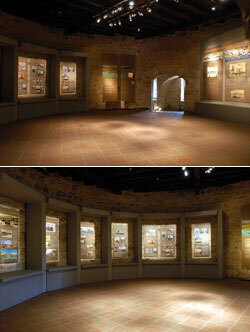 The exhibition is open daily and develops on the first floor of the White Tower. It is organized by the Museum of Byzantine Culture that is administering the monument itself.